First Conference of Biomedical and Natural Sciences and Therapeutics (CoBNeST 2018). SANS is excited to announce collaboration with several learned societies – CoBNeST, in which our SANS symposium and AGM will be held. 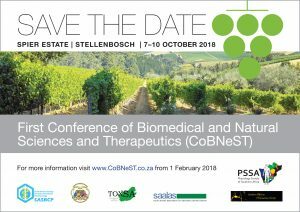 CoBNeST is an informal association between societies with shared interests related to basic, translational, and clinical biomedical and pharmaceutical sciences in South Africa, developed with the purpose of co-hosting conferences together to promote interdisciplinary research and collaboration.